Stainless steel 90cm freestanding cooker is rated 5.0 out of 5 by 5. Introducing an oven that cleans itself. Pyrolytic cleaning removes the need for you to use harsh chemicals to clean your oven. Simply set the Pyrolytic function, come back when it is complete and wipe away the residue. Experience a simpler, more enjoyable way to cook. Our unique Intuitive Oven Interface (IOI) makes our ovens so easy to use you wont need a manual. Plus the elegant full colour screen displays temperature and function feedback so you can easily program and check your cooking for impressive results without the extra effort. Elegant and stylish, the full colour screen displays temperature and function feedback. The high definition full colour animation clearly shows the oven's status and proves that functional design can be beautiful too. What's more, the Black oven range has a full black front when powered off. Yet, with just one touch from your finger, the oven display will come to life and be ready to create your next delicious meal. Designed for the entertainer and large families, this large capacity 125-litre oven will make catering for every occasion quick and easy. Plus, energy use is also kept to a minimum, despite its size. Take grilling to a new level of flexibility with the split grill system. Select to utilise both of the powerful grill elements, or just the one, depending on your cooking needs. For further control of your grilling, select to grill on either low or high temperature levels, or with the assistance of the fan. For added safety and confidence in the kitchen, the cooler touch door features an innovative door cooling system with quadruple glazed door panels. The design minimises heat being transferred outside the oven, while ensuring a cooler touch oven door. Take your cooking expertise to the next level with our innovative wok burner. With professional levels of power, you will experience super fast heating and amazing results every time. Enjoy unrivalled adjustability in flame power with the dual gas valve. Go from cooking at the highest maximum temperature to the lowest controlled simmer on the one burner with absolute ease. Experience a supremely stable and stylish cooking surface with flat cast rivets. Enjoy peace of mind when cooking with a large heavy pot with the practicality of a flat surface when moving pots and pans across the cooktop. The convenient press down and hold electronic ignition is operated by burner control knobs and alleviates the need for untidy matches and gas guns. For added peace of mind, the flame failure safety device shuts down the gas if the flame becomes accidentally extinguished while cooking. This gives you confidence to use your cooktop at the lowest simmer and also reduces the risk of fire. Rated 5 out of 5 by Mare from Masterchef Oven I bought this oven about 5 months ago and honestly I cannot believe this difference in the taste of the food & the final products AMAZING!! Rated 5 out of 5 by MGSH from Looks elegant and great features We bought the EFEP915SB model, and couldn't be happier with the looks and performance. What an improvement over our old freestanding dual fuel oven! We can now cook pizzas properly. 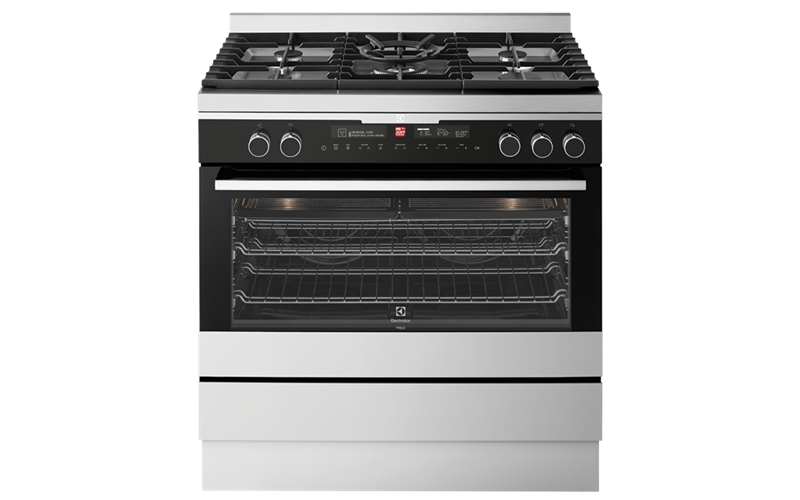 Rated 5 out of 5 by Goodlife from Love it Love the oven's elegant and stylish look especially the touch controls. 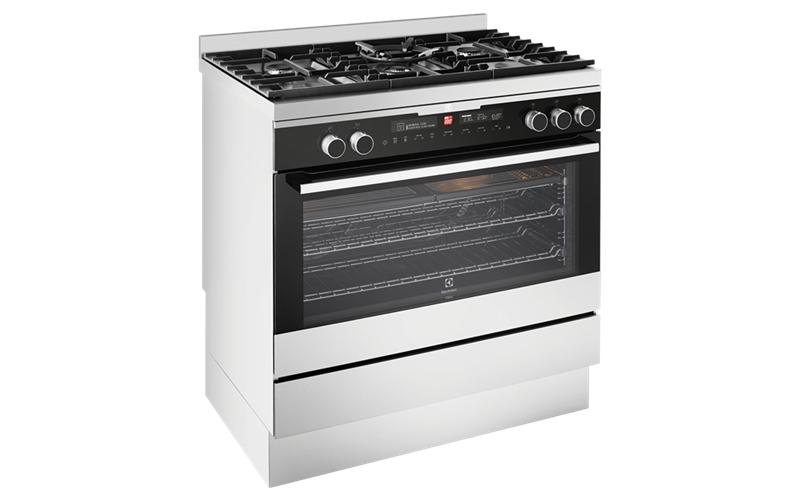 Importantly, it is easy to select the best cooking function and is very quiet when operating. The telescopic runners for the shelves glide effortlessly. The control of the flame for the wok burner is terrific allowing you to go to full flame to simmer effortlessly. And the cool touch oven door and mark resistant stainless steel is great for when the grandchildren arrive. Love it.